The Adult-Coloring craze had taken everyone by storm! Even my 2 year old daughter Mila knows how to use the Colorfy app and often uses it when she needs to stay still at church service. Even before adult coloring became so trendy, one of my officemates had been completing sheets after sheets of beautiful, intricate work of art with her colored pens. I initially thought that she draws the outline of these detailed photos from scratch and then colors it in at work. When I asked her, she said she just downloads and prints them from online. It's a hobby she picked up from doodling. The repetitive hand movement of coloring keeps her sane and calm, she said. I wanted to do the same thing and color a sheet myself. I started one but could not finish it. My work was not beautiful at all. The colors looked weird and strokes are uneven. Instead of tranquility, it gave me frustrations. Until I learned to let go of any judgement and just enjoy the controller carefree motions of filling in the white gaps with color pops. There are no rules. Roses can be black. Lions are blue. The fun of coloring is on doing it. Mila and I even practice coloring together. As much as I now appreciate my "work of art", I still think I can be better. Learning from experts will be a big help. 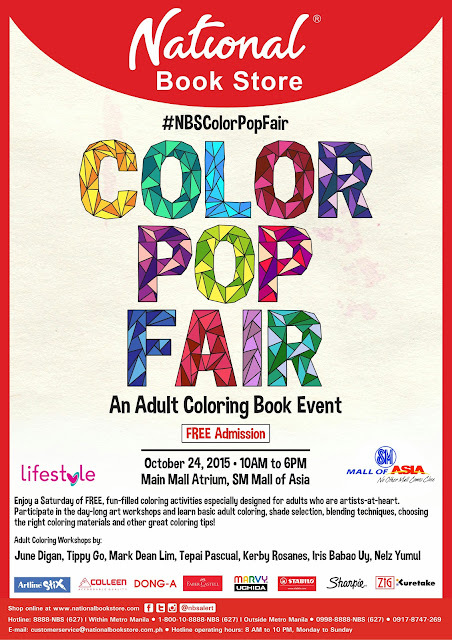 On October 24, National Book Store, in partnership with Lifestyle Channel and SM Mall of Asia, will hold its first ever “Color Pop Fair" from 10 a.m. to 6 p.m. at the Main Mall Atrium, SM Mall of Asia. Admission is free for all events and workshops. Registration starts at 10 a.m and I'd definitely be there. Enjoy a Saturday of free, fun-filled coloring activities especially designed for adults who are artists-at-heart. Learn basic adult coloring, shade selection, blending techniques, choosing the right coloring materials and other great coloring tips. Participate in the day-long art workshops. Choose from Zig Kuretake adult coloring demo by Iris Babao Uy, The Secret Techniques in Making your Coloring Look Professional by Alex M. Roxas, Mapedize your Bookmark – DIY Adult Coloring Bookmark, Creating Gradients with Chameleon Pens by June Digan, Sharpiefied Coloring with Carlo Arezza, Stabilo Adult Coloring Demo by Mark Dean Lim, The Art of Doodling and Stuff – A Create and Collaboration Workshop by Nelz Yumul, Coloring Tips from the Googly Gooeys by Tippy Go, Tips on Doodling and Adult Coloring by Kerby Rosanes, Marvy Uchida Basic Coloring Demonstration by Tepai Pascual, and many more. See posters or follow National Book Store on Facebook for more details. Shop online and buy eBooks at nationalbookstore.com. For reservations, call 8888-NBS (627) for calls within Metro Manila, 1-800-10-8888-NBS for calls outside Metro Manila, or text 0998-8888-NBS and 0917-8747-269. The National Book Store hotlines are open Mondays to Sundays from 8 a.m. to 10 p.m. Follow National Book Store on Facebook, Twitter and Instagram (@nbsalert). Tag #NBSColorPopFair to join the discussion.